Evie stared up at the building and shuddered. She’d never liked the tall ones. She’d rather keep her feet on the ground. Probably her gypsy heritage. The highest she liked to get was the back of a horse. But if she wanted the ability to save her people, she had to do it. She had to go up. Inside, a massive foyer lined in swirled, black marble echoed with her footsteps as she approached the reception desk. The guard glanced at her, grunted, then pointed to a door next to the desk. Above the door, the word “Up” glowed green. A door on the other side of the desk sported the word “Down” in red. She squared her shoulders and stepped toward the Up side. The door slid open as she approached with a soft, slick sound. It all seemed too easy. It felt like a trap. Still, her people counted on her. They needed this. They needed the ability to protect themselves from forces beyond their feeble attempts to fight. She stepped through the door. It slicked closed behind her with a click. “Hello? This thing is broken. Anybody?” Her voice sounded thin, even to her own ears. She gulped, trying not to let the complete lack of response bug her. She’d heard that the journey must be made alone. Legends suggested some sort of test, but none explained exactly what. She hadn’t expected the test to be in an elevator, heading up a high rise to a floor you couldn’t see from the street. The numbers continued to jump all over the place. She closed her eyes and waited. It was better if she just didn’t watch. A soft click startled her. Her eyes flew open, and her hands formed fists before she could stop them. The elevator door had evaporated, or so it seemed. Fog greeted her. Nothing but fog. The same fog she’d seen from the street, she assumed. She could see nothing in it. No people, no shadows of office furniture, no reception desk. Just the fog. The air smelled fresh and clean, something she hadn’t experienced in a long, long time. Even then it had been in the deepest part of the forest. She took a deep breath and savored it. It smelled like fresh overturned earth after a spring rain. The kind that wiped away the soot and made everything new again. A soft ding sounded from inside the elevator. She glanced up, and saw the word “Exit” flashing in red above the door. This must be her floor, then. Except…there was no floor. Evie gulped, but the movement caught in her throat. She looked down from the door. Fog swirled. She looked out. More fog. Exit flashed, faster now. The door must be about to close. Her people…she was the only one to save her people. But nobody had told her it would mean stepping out of a perfectly good elevator into nothing but fog. What would happen? Most likely she’d plummet down however many stories that was to the pavement far below. Fog couldn’t hold her, no matter how dense. She licked her lips. What if she didn’t step out? She couldn’t face her people. She couldn’t go back and tell them she’d been a coward. They were counting on her. They would die if she didn’t. All of them. And if they died, she’d wish she had too. Gathering every ounce of will power she possessed, she inched up to the edge of the door. She lifted her right foot and extended it out. Evie said a quick prayer to the Light, took a deep breath, and stepped out of the elevator. Not a nice place to leave it, I realize. 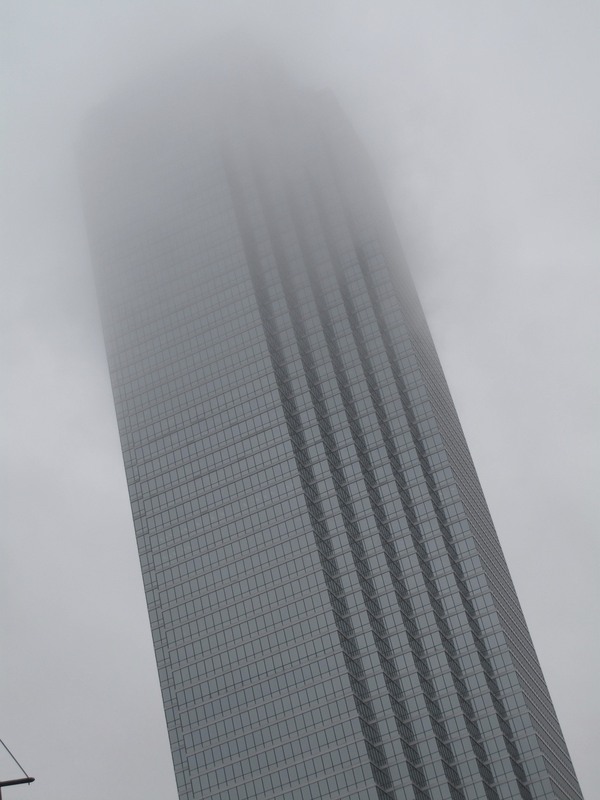 It’s nearly New Year’s Eve and I feel like we are all about to step off the 2011 elevator, into the fog that is 2012. What will happen? Will we plummet to our deaths as the Mayan calendar ends? Will we find, like Indiana Jones did, that the leap of faith is rewarded with a nearly invisible path which will catch us? Or maybe something less dramatic. Maybe the fog will cradle us and give us a soft landing in the new year.